The leaders of American medicine (I had to start this piece with something – there are no leaders of American medicine – we’re too balkanized) are forever issuing pronouncements of how many doctors we should have. We never have the right number, we oscillate from too many or not enough. They usually ignore how many hours the doctors we have work. A recent paper (Trends in the Work Hours of Physicians in the United States) in the Journal of the American Medical Association examines the subject. Using Census Bureau data Staiger et al showed that the hours worked by physicians in practice stayed steady at about 55 hours/week from the mid seventies until about 1996 when hours worked began a decline that plateaued at about 51 hours in 2006. See figure below. The decline in hours worked was true of all groups studied. Though women doctors work less hours than men the decline was the same in both. The greatest decline, however, was in doctors less than 45 years old. 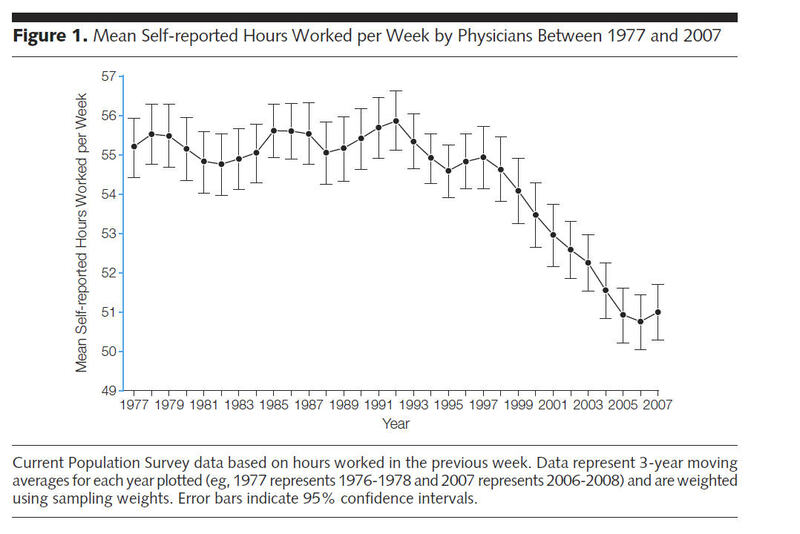 Exactly parallel to this decline in work hours was a decline in physicians’ fees. See figure below. The obvious conclusion about this relationship is that doctors chose to work less and therefore their incomes fell. This may be true, but the decrease in earnings is greater than that in hours worked. Another explanation is that physicians don’t wish to work as long as was the norm a generation or more ago and that this choice is made irrespective of income. Regardless of the reason, a 5.7% decrease in hours worked by physicians primarily involved in patient care, out of a workforce of approximately 630 000 doctors in 2007 is equivalent to a loss of approximately 36,000 physicians from the workforce [data taken from the above paper]. Interestingly, work hours in other professions like law, nursing, and engineering have not declined. If physician demand is going to increase, as most seem to think, we’ll have to make up this shortfall by training more doctors or by using more physician extenders. We are building more medical schools confident, based on no thought, that there are enough qualified applicants to fill as many new positions as we create in our new medical academies. The latest data from the American Association of Medical Colleges show that 46.1% of all applicants to US medical schools are accepted. If one just looks at students with minimal qualifications – GPA above 3 and MCAT scores above 24 (a perfect score is 45) – the acceptance rate is well above 50%. Medicine may not now attract as many top graduates of our colleges and universities as it has for most of the past century. The combination of physicians working less and new medical schools proliferating like fast food joints will likely result in the acceptance of weaker applicants. Thus, the next generation of American doctors may be composed of people who went to medical school because they couldn’t get into law school. I haven’t even begun to factor in the impact of government “reform”. “physician extenders” Is this an industry term? It brings strange cartoons into my mind. Even when I was a student, it was much harder to get into veterinary school than medical. Several guys I knew went to other countrys to get their dvm. The term includes nurse practitioners, physician’s assistants, etc. Veterinary school is another complex problem that I’m not qualified to address. I’ll just say that the number of vet schools has been kept almost constant (everyone is a monopolist at heart); the supply of vets is so low that they can all go into small animal practice leaving almost no vets to care for livestock. Perhaps congress can fix this problem next. One thing missing here is the speed with which patients are taken care of. It would be interesting to find out how RVU’s per doctor changed over the same time period. I know that I work twice as fast now than when I started. I know of many doctors who have maxed out and now are faced with trying to do surgeries faster and faster. Where this will take us as things further decline is anyones guess. Wham…Bam…thank you ….. a line from an old college song. If doctors were seeing the same number of patients but spending less time with each one that should have had an effect on fees. They should not have gone down even faster than hours worked. So I think there’s more going on than just putting the patient on an assembly line. I’ve always been very lucky getting very good equine vets and even 3 hospital facilities (within 50 miles)with various specialties. As long as there are race and training tracks…….. However these are most always equine only vets. So I don’t know how other livestock is faring.